I felt like doing nothing all weekend, but I did drag myself off the couch to go for a swim, and I'm glad I did. (Swimming: The best activity when you just want to keep crying!) The only way I was able to motivate myself to leave the house was to dress colorfully, in clothes I love. Except for the blue tweed blazer from Jessica London (which is currently on clearance for a steal), I purchased all the other items years ago. 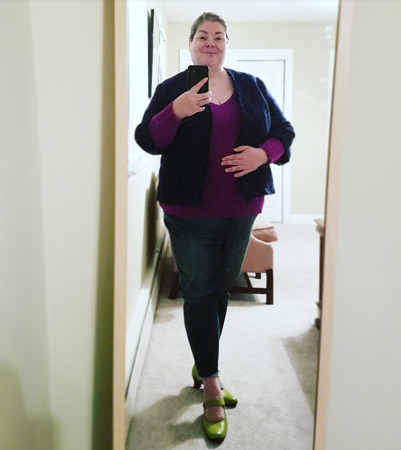 The purply-pink sweater was a Lane Bryant purchase; the jeans are from Torrid; and the shoes are Camper. 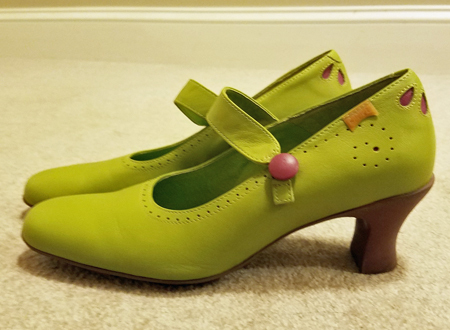 I love this combination of bold colors (navy + pink + chartreuse), and the shoes really tie it together, as the detailing and heel are a similar dark pink to the sweater. For reasons I don't entirely understand myself, I tend to favor bright, happy colors when I'm feeling down. Today, for example, I'm wearing a vibrant blue t-shirt with cut-off jeans and purple knee socks. I guess avoiding drab colors is one of the ways I try to keep my chin up. Anyway! As always, all subjects related to fat fashion are on topic, but if you want a topic for discussion: What colors and styles do you wear when you're feeling down in the dumps?